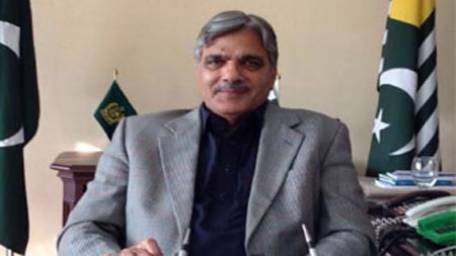 ISLAMABAD, Aug 1 (APP): Minister for Kashmir Affairs and Gilgit-Baltistan Chaudhary Barjees Tahir Monday said Kashmir issue should be resolved in light of United Nations resolutions. Speaking in the National Assembly, the minister said the UN should play its due role while implementing the relevant resolutions to resolve Kashmir issue. He said the UN and international community should shun double standard and concrete measures should be taken to force India to give right to self-determination to the people of Kashmir. The minister said it was the responsibility of the UN to implement its resolutions about Kashmir. If plebiscite could be held in East Taimour and Sudan then why not in Kashmir, he added. He said Pakistan would continue its moral, diplomatic and political support to Kashmiris in getting their right to self-determination. He said the freedom movement in Kashmir was underway since Radcliff Award as over 70 per cent of its population was comprised of Muslims. The minister said India had always accused Pakistan of backing armed struggle in the occupied valley. However, he said, after the martyrdom of Burhan Wani, it was an indigenous movement being waged by the people of Kashmir. Barjees Tahir said India had started settling Hindu Pundits in the held Kashmir and deployed around 800,000 troops to inflict oppression on Kashmir people. He said the PML-N government had always taken pragmatic steps to resolve the longstanding issue of Kashmir according to the wishes of Kashmiris and UN resolutions. He said in 1999, the then Indian PM Atal Bihari Vajpayee also wanted to sort out Kashmir issue, however, it could not be resolved due to Kargil issue. He said Prime Minister Muhammad Nawaz Sharif was taking up the Kashmir issue at the UN General Assembly from the last three consecutive years, while on the directives of the PM, July 20 was observed as Black Day to express solidarity with Kashmiri people.